One of the three parameters in project management is time. Throughout the project execution project teams soon find that there is not enough time - hectic and stress spreads. Having too much time at your hands can be just as counter-productive because a complete lack of time pressure can be motivation blocker. Effective time management is needed. In the quest of increased productivity, try these strategies that help you make optimal use of the limited time resources. Time management helps you get your job done more efficiently within a given time frame. Everybody has the exact same number of hours per day – the goal is to take control over the time you have and make optimal use of it. Tony Schwartz and Jim Loehr, authors of The Power of Full Engagement, say the important factor is “energy management” rather than time management. According to them, if we want to be most productive, we need to evaluate our energy level and determine our personal rhythm of daily highs and lows. We can make the most of our work hours if we complete the most demanding tasks during energy highs. Of all the work we have to do within the 168 hours we are given any week, 80 percent of the tasks take up 20 percent of our time. The remaining 20 percent of our tasks however, account for 80 percent of our work effort. This principle is known as the Pareto Principle, named after its inventor Italian economist Vilfredo Pareto, who used the 80/20 rule to describe how wealth is divided among his fellow countrymen. The core lesson to take away from the 80/20 ratio is: There are activities that have greater results than others. Even though the ratio is more of an average estimate than an exact number, you should identify the 20 percent tasks that have the 80 percent results and make them your priority. The credo: start with the essential and perfect your work later. Don’t get lost in the details of a task and maintain the greater picture. Not all project related tasks fall under your personal responsibility – even as the project manager you have a very defined role and competency. On the other hand, certain tasks don’t necessarily have to be completed by a specific team member. Lastly, in contrast to a feeling we sometimes get, not every task has to be completed immediately. 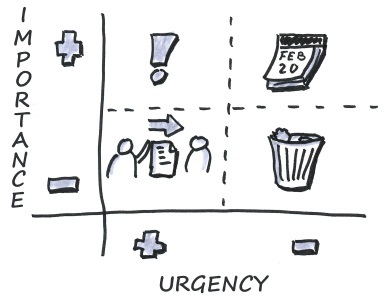 The Eisenhower Matrix includes all these aspects, creating four categories that help prioritize our work according to their urgency and importance. Start with completing the most important and urgent tasks and schedule deadlines for the least urgent tasks on your list. Tasks that are of secondary importance and should be completed soon are best delegated to team members who are better skilled and have more capacity. Delegating tasks however, requires that you have an agreement with everyone involved. You should never make such a decision while the people affected by it are out of office. It is best to have a face-to-face conversation with the team members because it gives the opportunity to clarify details. 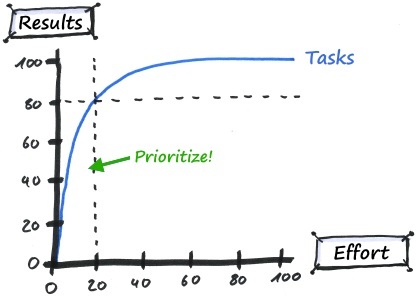 One question remains: What to do with tasks that are neither important nor urgent. Eliminate them. Make sure you don’t have an end-to-end schedule for every work day and instead include buffer times. Free slots on your calendar tremendously increase your flexibility and you will thank yourself if your schedule doesn’t get overthrown completely if something happens unexpectedly. Keep your desk organized; work unrelated stuff lying around your work space has great potential to distract you. If you have the luxury of working in a small office with only a few employees or even have an office to yourself, feel free to close your door while you are working on important tasks. This signals both to your colleagues and yourself that the task at hands requires your full attention. 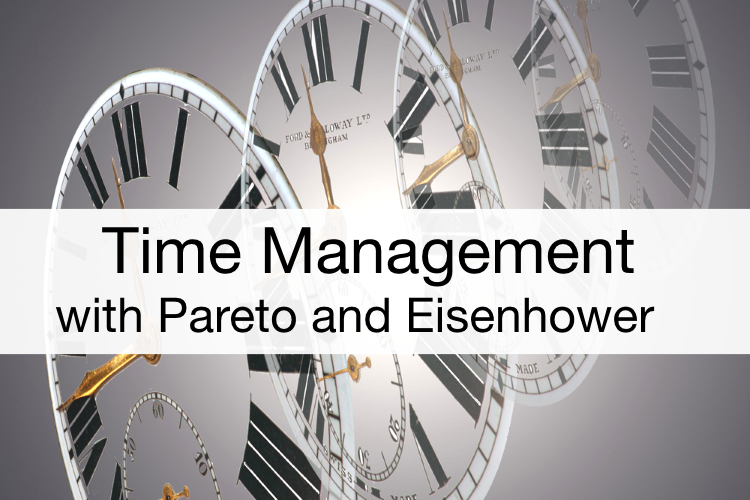 Effective Time Management with Pareto and Eisenhower - InLoox • Copyright 1999-2019 © InLoox, Inc. All rights reserved.